Home » The Company » Testimonials » See you guys in 2015!!!! Our Everest Base Camp trekking and historical place sightseeing in Kathmandu and Pokhara round trip in Nepal 2014 has already finished. It has been a very relevant tour, which has gathered most of the top researchers in the field of touring. I thank all our group members and the Nepal crews who have attended the trek and sightseeing, and we hope that they have enjoyed beautiful Mountain View, historical story, cultural show, temple and monasteries and the social events enclosed. We are already thinking about Nepal Manaslu in 2015. Our trip from Kathmandu historical sightseeing,- Sightseeing in Patan Bhaktapur 13 days trekking in Everest Base Camp - Rafting in Trisuli river drop to Pokhara- Sightseeing in Pokhara - Drive to Chitwan National Park - Chitwan National Park - Drive to Kathmandu - Drop to Airport. I never saw that kind of airport in Lukla. It was imaging !!! The view from Kalapattar was wonderful coz our trekking guide recommend us to go early. I read the book “Thin Air” now I feel when I was in Base Camp. We all our team was very very happy to share your “Asian Hiking Team” well suggestion, deep knowledge, and touring management. We are 17 persons in our group but your management was wonderful. We decide already our next destination is Nepal. We need to talk more to fix programs 2015 trip but we are sure to do trip with you in 2015. 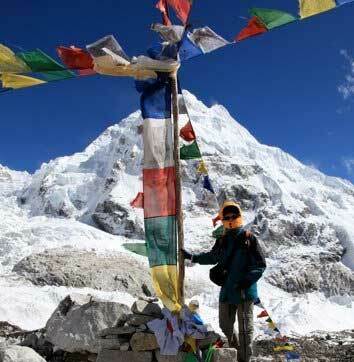 May be for 14 days Manaslu Larky Pass trekking is the best we also want to visit Nagarkot. Thank again.